Office workers often struggle to get enough movement into their day, but small changes make 10,000 steps realistic. To achieve good health, experts often recommended walking at least 10,000 steps a day. For those who work in sedentary office jobs, however, this can sometimes seem like a daunting challenge. A growing body of research shows us just how important it is to combat inactivity. Long periods of sitting are said to lead to increased risk of heart disease, obesity, diabetes and cancer. The World Health Organisation even listed inactivity as the fourth biggest risk factor for global adult mortality. But it’s not all doom and gloom – there are plenty of ways you can be more active in the workplace. Here are a few ideas to get you started. 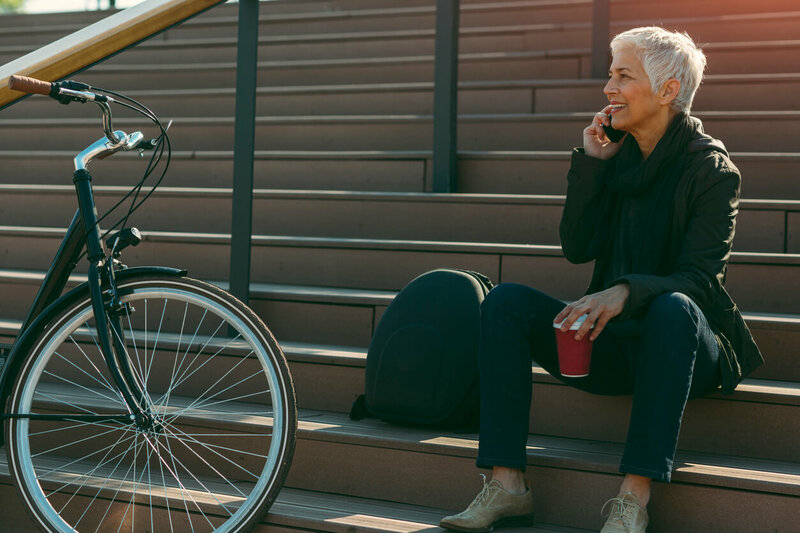 If you can bike or walk (or even run) to work, this can be an excellent way to fit more activity into your day – and you’ll arrive feeling fresh and energised, with a clear mind. Of course, not everyone lives close enough for this to be a realistic option, but you can still find ways to make at least part of your trip more active. Get the train part of the way and ride the rest, get off the tram a few stops early and walk, or park your car a kilometre or two away. Try a few different things and see what works for you. Go out and get your coffee, tea or smoothie instead of letting someone else pick one up for you. Even better, you could make it a challenge to try a new place each day for a week, instead of always going for the closest option. Taking a stroll with some colleagues is a quick and easy way to relax, socialise and get in some more physical activity. We all have those meetings that stretch on for an hour, but could really be accomplished in 15 minutes. Try organising a standing meeting – research shows this can be a good way to increase efficiency, making sure things don’t drag on unnecessarily, as well as getting you out of your chair. For smaller groups or one-on-ones, a walking meeting can be a great way to get things done while getting in a little physical activity. The change of pace and scenery can also help reduce tensions and encourage more creativity and free-flowing conversation. Studies have shown that when you wear comfortable clothes and shoes to work you are more likely to be more active. It makes perfect sense – taking the stairs looks a lot less appealing when you’re in towering high heels or a stiff suit. Even if your work dress code requires you to wear more formal clothes, chances are there are ways you can make your clothing more comfortable – whether it’s investing in a great pair of flats, choosing a chunkier heel that’s easier to walk in, or finding a suit made from a more breathable and movable fabric. It’s a lot easier to be active when you can keep track of how much you’re really moving. Yes, there’s a reason everyone is wearing activity trackers like Fitbit! Put one on your wrist and find out how many steps you do in a normal day, then set yourself a goal to improve on that number every day. Tracking your activity can be an excellent way to motivate yourself and keep you reminded of your goals. Medibank offers a range of Corporate Health Covers at discounted rates. Find out if you are eligible here or call 131 680 to discuss with our customer service team.